A rich and varied career has led Sandy to winning tactics and a keen business mind. Where next for US trade policies? TPP is out and TiSA could be in – where do we go from here? Can you avoid short-termism as a CFO? There is increasing pressure to manage expectations against wider long-term goals. What would territorial tax mean? The last tax reform occurred in 1986, and changes could bring complex issues to the fore. 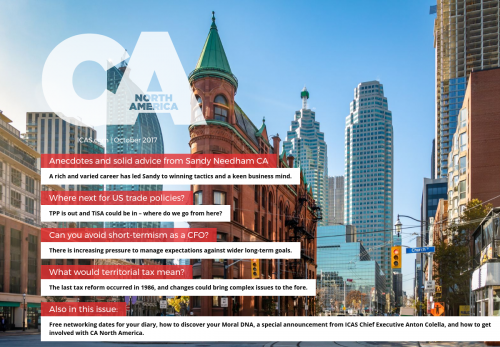 Free networking dates for your diary, how to discover your Moral DNA, a special announcement from ICAS Chief Executive Anton Colella, and how to get involved with CA North America.